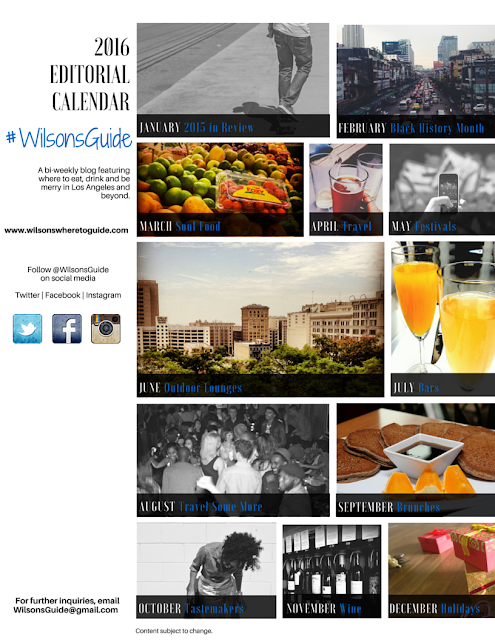 Want to know what to expect on the #WilsonsGuide blog for the next year? Check out the 2016 Editorial Calendar below. Here's a glimpse of blog post themes I'll cover each month. Of course, content may change, but at minimum, this is what I plan to write about, throughout 2016. Click on the image for a larger view and let me know if there's anything in particular you'd like for me to cover, too! I’ll Be Back…: To check out the Happy Hour and breakfast! The first thing that caught my attention about 208 Rodeo was its location. 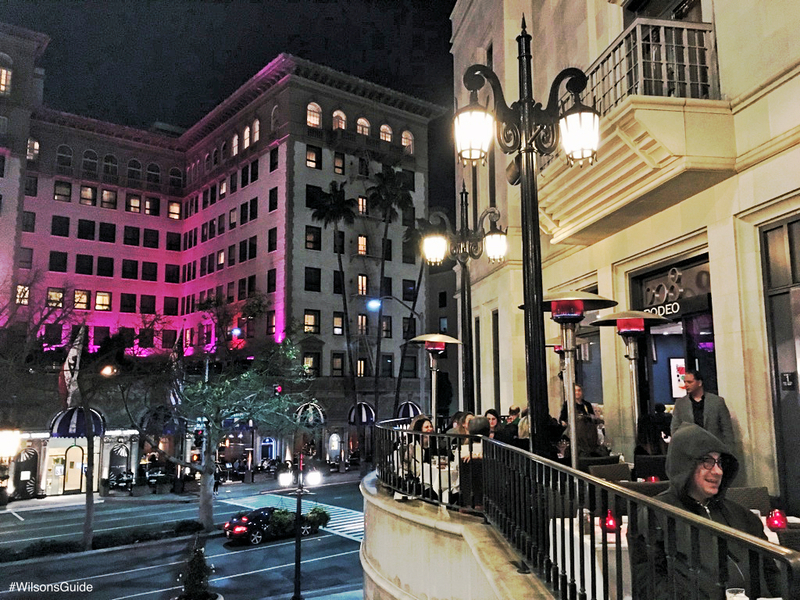 Situated on a raised terrace and across from the historic Beverly-Wilshire Hotel, the tiny restaurant overlooks a bustling, trendy stretch of Wilshire Blvd. and Via Rodeo, the famed part of Rodeo Dr. that turns into a pedestrian walkway lined with high-end luxury stores. 208 Rodeo is right smack in the center of all the prime action in Beverly Hills. You can watch all of the commotion pass you by, while dining and/or drinking, al fresco on the terrace. 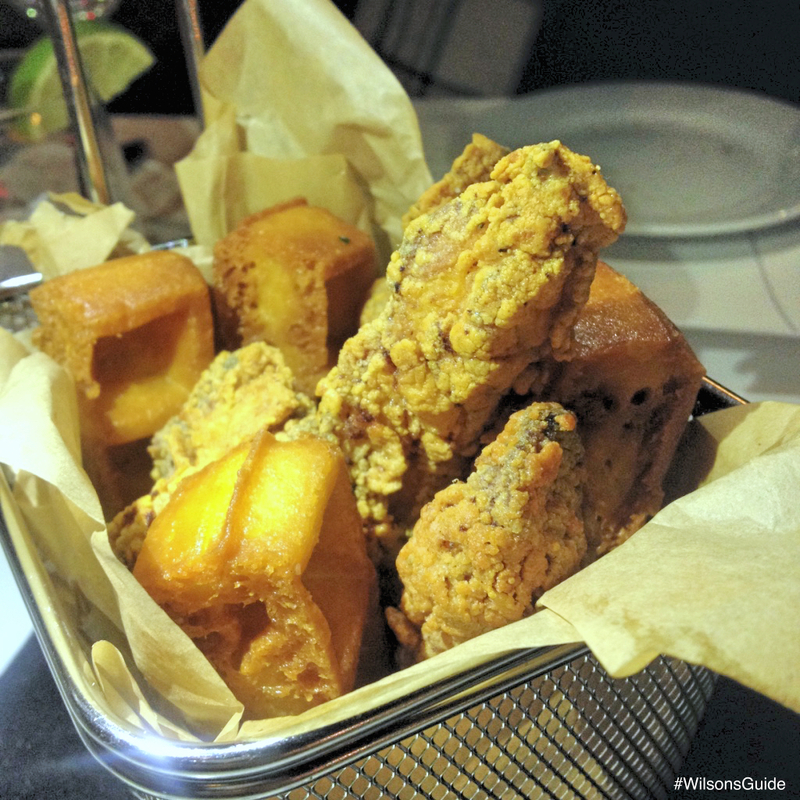 Last week, I attended a media dinner to experience items from the restaurant’s new winter menu. In total, there were 12 dishes we dove into, ranging from soups and starters to entrées for all appetite sizes and preferences. While there wasn’t a specific geographical theme that ran through each and every selection — i.e., some dishes were clearly more French-inspired while others were more American — each one had its own unique personality, with a fusion of popular and out-of-the-ordinary ingredients that worked well together. The Chicken & Waffle, is a basket of well-seasoned, crispy fried chicken breast strips and crunchy waffle “fries,” accompanied by a simultaneously sweet and tangy maple-soy-chili sauce. While I’m used to dipping my fried chicken in ketchup and hot sauce and my waffles in syrup, the maple-soy-chili sauce works surprisingly well for both. Great to share and to kick off a meal as a starter. 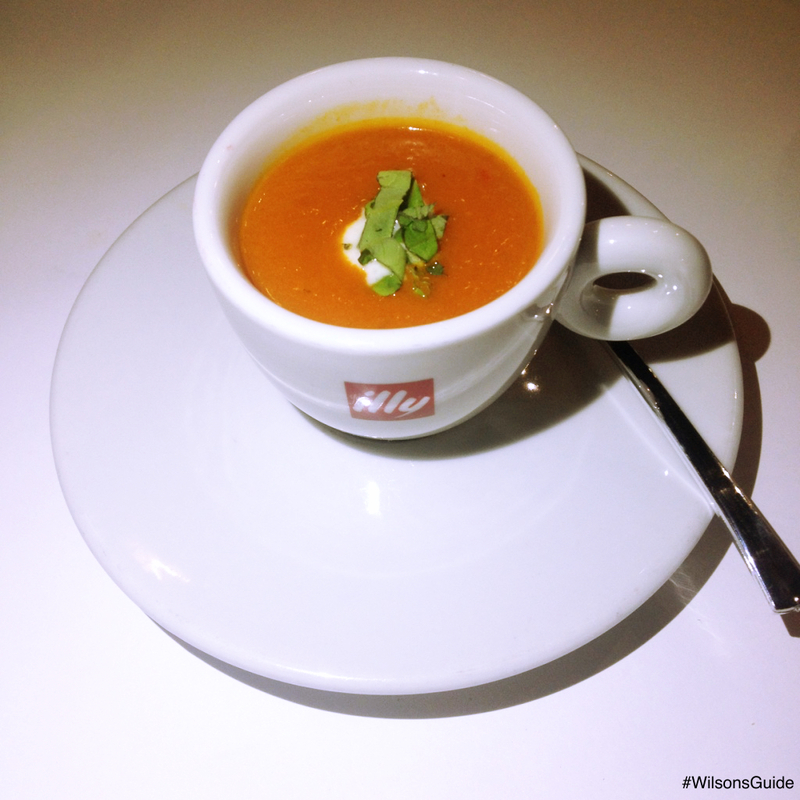 The Tomato Bisque with Parmesan cream and basil was one of the best I’ve tried. I’m typically not a tomato soup or bisque fan, but the balance of tomato and cream is just right. It’s exactly what a winter soup should be — hearty, frothy and all kinds of deliciousness. 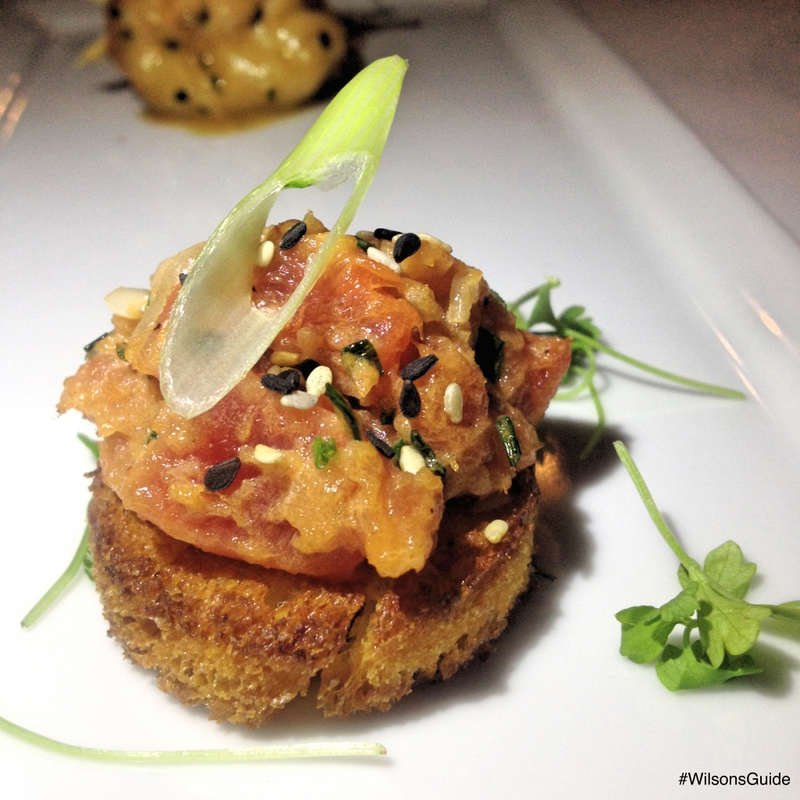 The Spicy Tuna Tartar features sashimi grade Ahi tuna accompanied by cucumbers and crostini. Thick chunks of tuna have an intense flavor and the “spicy” aioli gives it a subtle kick. I preferred munching on the tuna by itself, as I felt that pairing it with the crostini or cucumber, while adding an interesting crunchy texture, detracted from the intense flavor of the tuna. This is another appetizer that’s good to be shared. 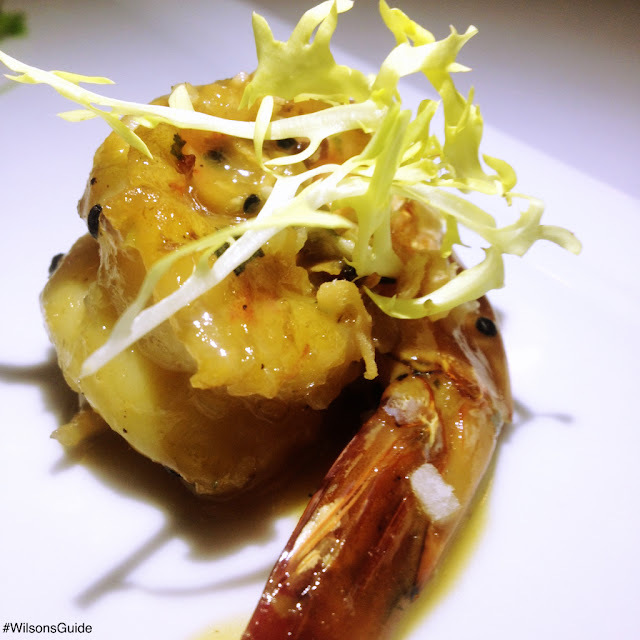 An example of a dish with pan-Asian influences, the sautéed Sesame Shrimp has a slightly sweet coating, thanks to a tangerine reduction and sweet Thai chili glaze. It's topped with sesame and toasted coconut. The shrimp were phenomenally prepared: large, plump and firm yet still tender. 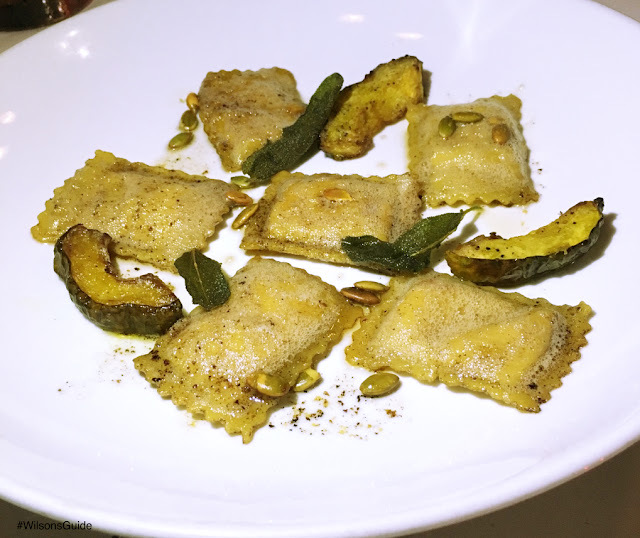 The Pumpkin Ricotta Ravioli was probably my favorite entrée of the night. It's a prime example that vegetarian options don’t have to be bland or one-dimensional, simply because they’re meatless. Drenched in brown butter, the ravioli is lightly crisp on the outside and rich and creamy in the inside, filled with ricotta cheese. Sage and squash are lightly pan-fried, having a crispy consistency, and are added along with pumpkin seeds, for the final touch. 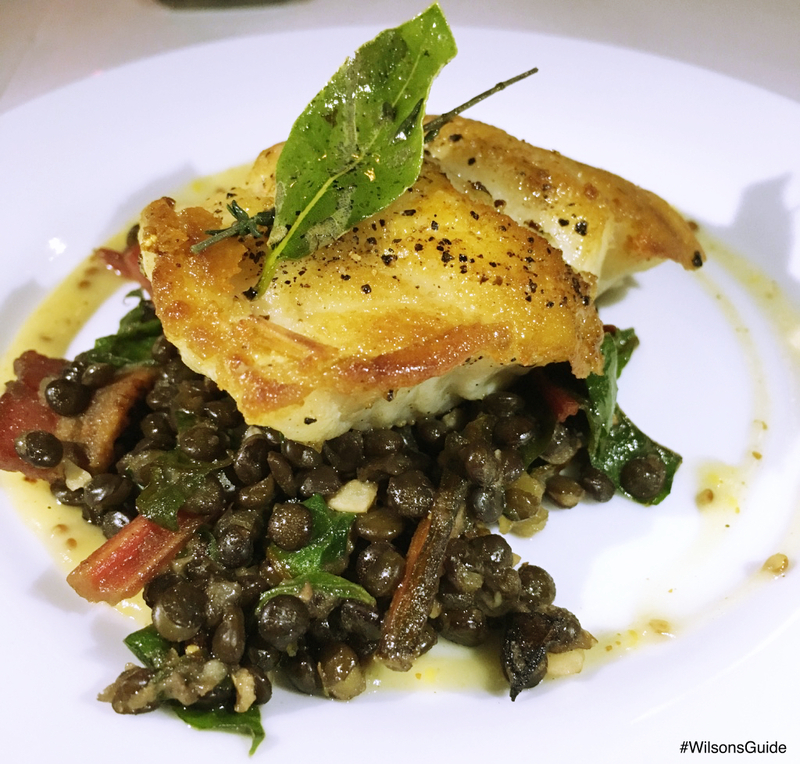 The most intriguing aspect of the Sea Bass was the bed of Swiss chard, bacon and black boluga lentils, tossed in a grain mustard vinaigrette, underneath it. What an unexpected, yet surprisingly delightful combination. The sea bass itself, a New Zealand bluenose, was very flavorful, buttery on the inside and crispy on the outside. The 208 Bolognese is a rustic dish, reminiscent of the French countryside. 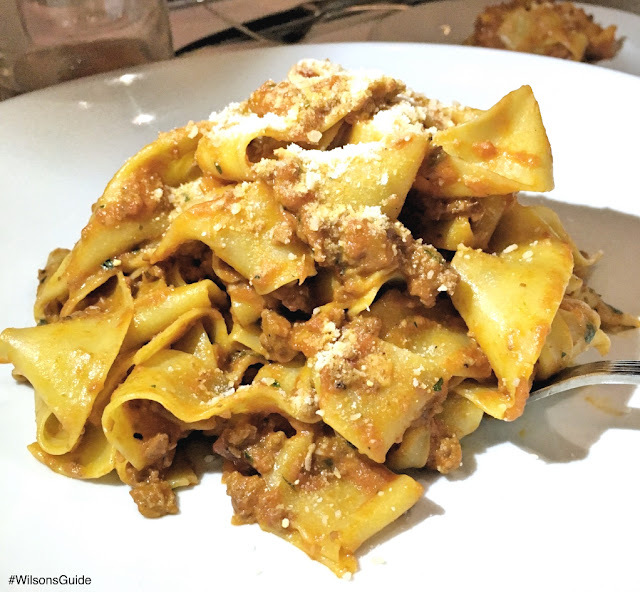 Large handmade Pappardelle pasta gets tossed together with lamb, tomato and mint, all in a garlic-shallot sauce and coated with crumbled cheese. The pasta noodles are decadent and literally melt in your mouth. 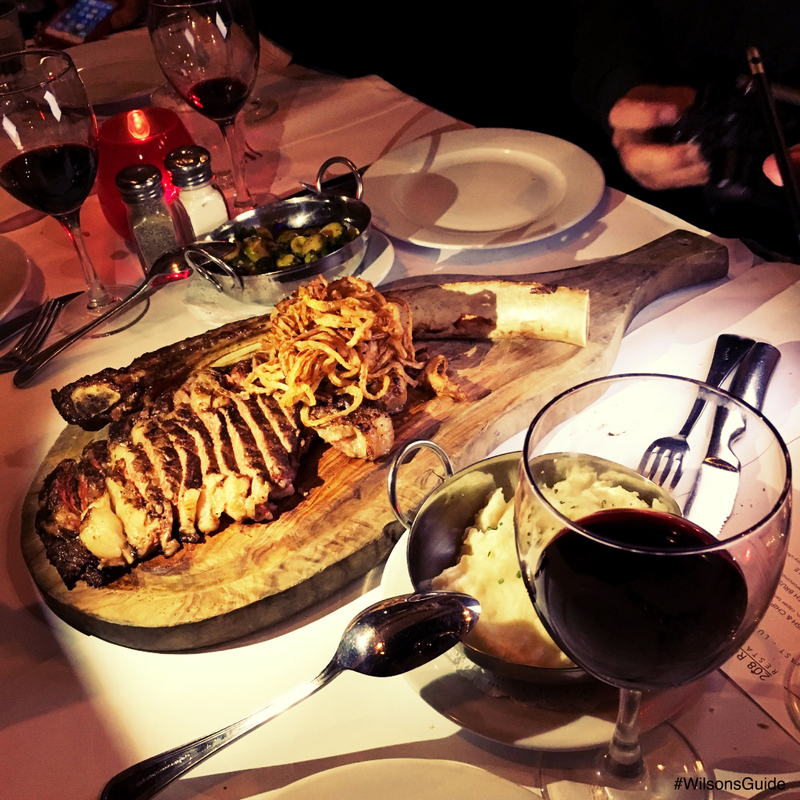 An option worth selecting for those who have a larger appetite. Since I don’t eat beef, I didn’t try the miniature version of the Truffle Cheeseburger or the Tomahawk Steak, but I absolutely had to take a snapshot of the steak (pictured below). 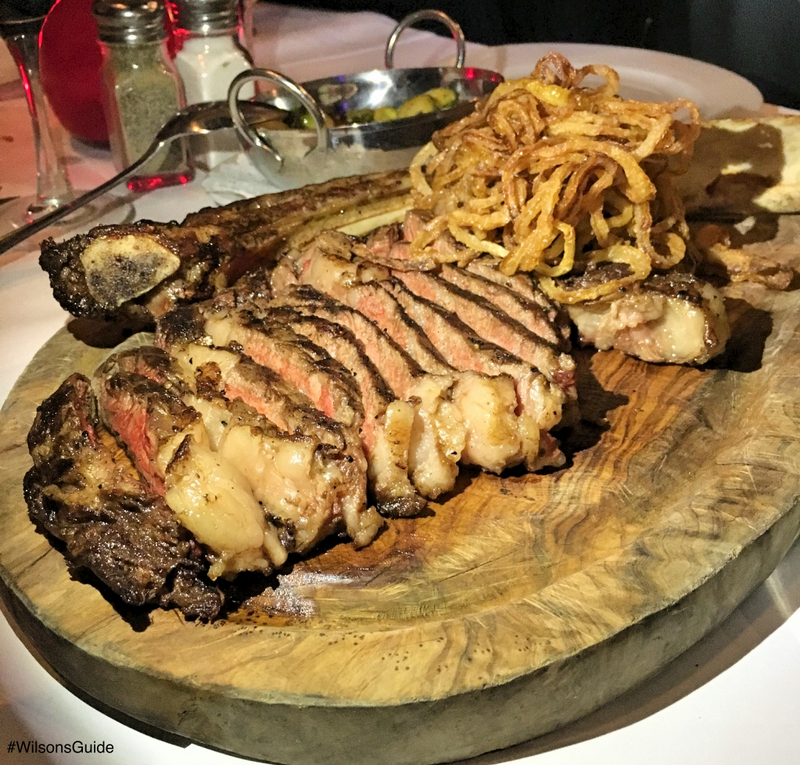 Served on a large wooden slab, it's a 28-day, dry-aged, bone-in, 28 oz rib eye cut, topped with fried onion strings and potato purée. Talk about presentation! 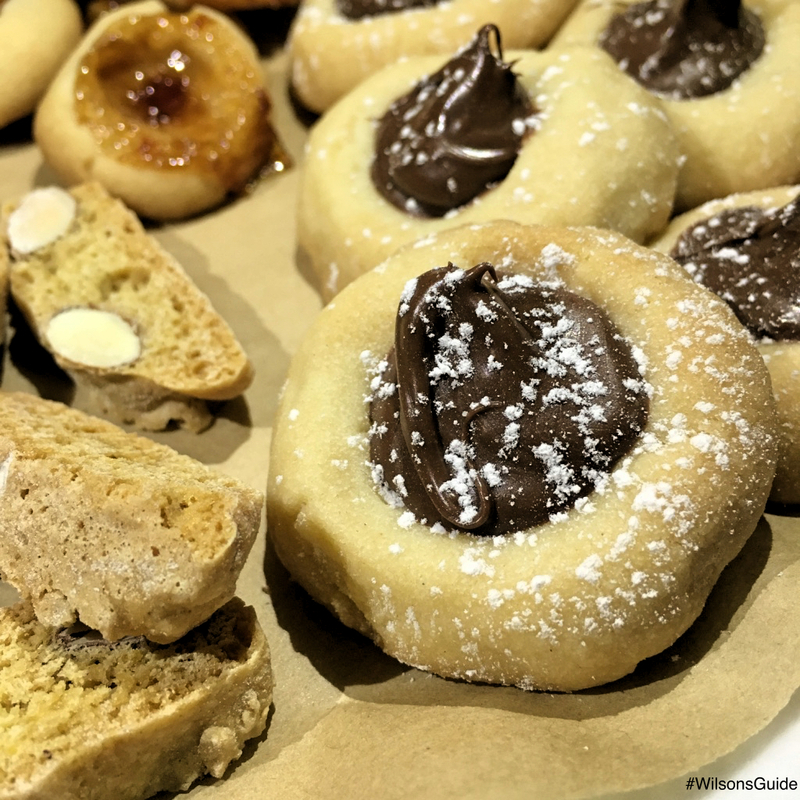 And, we ended the night wit a special treat — cookies and biscotti, made by owner Yiffat Rublevich. 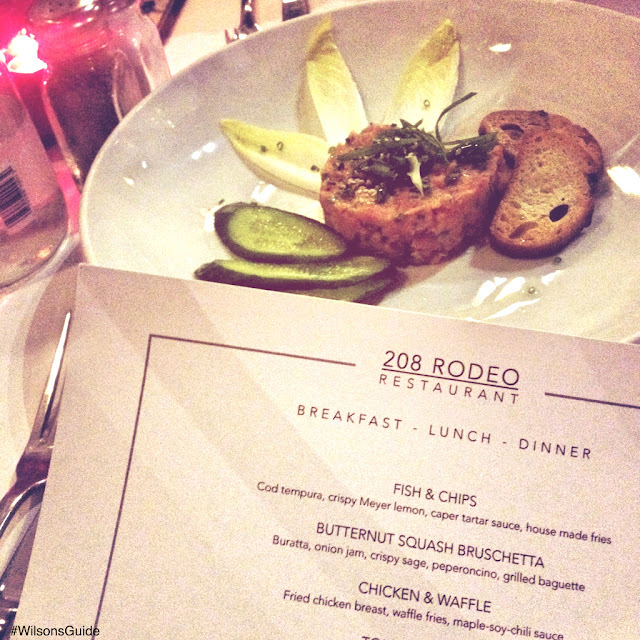 Overall, 208 Rodeo offers an impressive L.A. experience, with spectacular views and ambiance, and some exceptional dining choices to match. You’ll be paying for the experience, as it ain’t cheap, but it could be worth it, especially for special occasions, such as a romantic date night or to show off the best that L.A. has to offer, to out-of-town visitors. Before we get too enwrapped in the New Year, let’s take a trip down memory lane and reminisce on all of the marvelous experiences that 2015 had to offer. To do so, I've compiled a “Top 5 of 2015” list, featuring the best highlights from this past year, as captured through my #WilsonsGuide blog posts. Read on and feel free to leave me your 2015 highlights, in the comments section below. Hope you enjoy and I look forward to capturing many more exciting new adventures, in 2016. #5) Phenomenal Seasonal Events. While L.A. most certainly has outstanding restaurants, bars/lounges and other permanent social destinations to keep us thoroughly entertained, there’s no shortage of seasonal happenings that are exclusive only to the City of Angeles. Marquee events like dineLA Restaurant Week and GRAMMY Week (pictured below) continued to give us access to fun, out-of-the-ordinary culinary experiences and high-profile concerts featuring the best artists of the day, respectively. A few really good new series launched — and unfortunately didn't continue — in 2015. “The Soul Shakedown” debuted as a monthly series at The Federal Bar, featuring live bands playing soul, funk and R&B, and “Taste Saturdays” featured chefs from around the States whipping up incredible brunch creations, all to the backdrop of a DJ spinning decade-spanning hits and endless mimosas. Hopefully, they’ll be resurrected in 2016, because they were a lot of fun. #4) The names of high-profile women slaying it in the political sphere are steadily increasing. Fortunately, this trend is inspiring and enabling more amazing women to pursue careers in politics, on the national and international fronts, but also on a very important level: the local one. 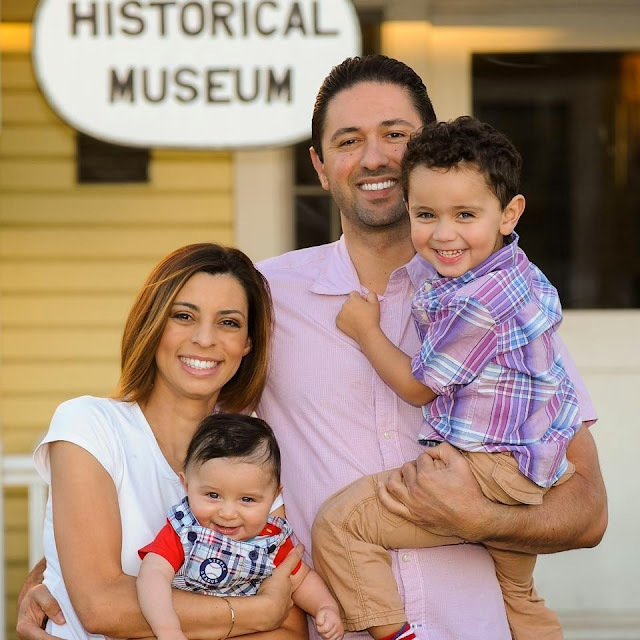 In February 2015, Candace Nafissi announced her run for Redondo Beach City Council District 3. What makes her story so motivating is that she was literally like any of us — a mother, a wife, a full-time worker — who decided that she wanted to make a difference, and went after her dream with guts and resilience. She became one of the youngest candidates to enter a race and if elected, would have been one of the first women on the Council. While she may not have won the seat (she lost by 13 votes in a runoff), her story of balancing diapers and debates is still noteworthy and incredible to read. #3) I had been slightly distraught when Public School 213, one of my favorite happy hour haunts, temporarily closed for a rennovation, but my spirits were immediately lifted with the March grand opening of its sister location, Public School 818 in the San Fernando Valley. A school-themed gastropub, Public School 818 takes a nontraditional approach to the American classics we’ve come to love. Buffalo wings morph into Crispy Buffalo Cauliflower; mac’n’cheese gets topped with kale, sea salt & vinegar chips and chorizo sausage; kale replaces romaine lettuce in the Caesar Salad. But most importantly, the food is done very, very well — in taste and presentation. It’s great to see the Public School brand expanding, also opening locations in Dallas and Las Vegas. #2) Fantastic, FREE Live Music. There’s most certainly not a shortage of opportunities to hear exceptional live music in L.A., and I got to see and write about some breath-taking performances, including by Meg Mac, a recording artist from Australia, and GRAMMY Award-winning singer Bruno Mars. 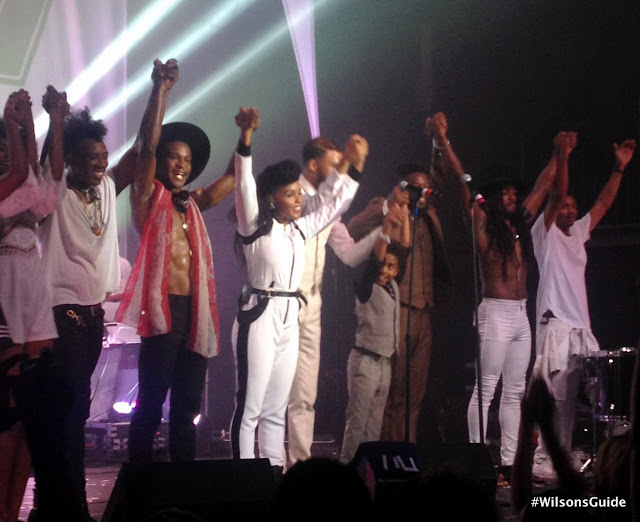 But hands down, one of the best shows I attended of 2015 was the Janelle Monáe and Wondaland Present The Eephus Tour, powered by Toyota at The Fonda Theatre in August. Yes, she and her Wondaland crew (St. Beauty, Deep Cotton, Jidenna and Roman GianArthur) put on an entertaining free concert, but more importantly, they made a point to address current social issues plaguing the U.S. They sang “Hell You Talmabout,” which pays homage to the African-Americans who have died from police brutality. I’ve said this before and I’ll say it again: I applaud and happily support artists who don’t only make amazing art, but who are also using their positions of power as leaders to bring about positive social change. 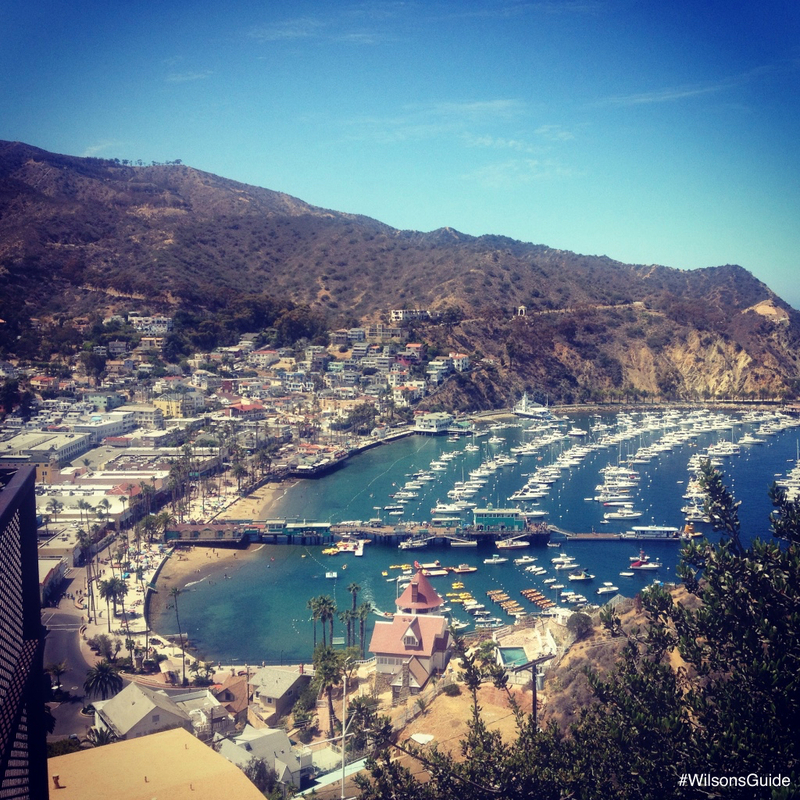 #1) It’s Still All About Traveling…Back in 2012, traveling made my No. 1 spot, and three years later, traveling remains in the same position. More than ever, so many people are itching to check out another city, new travel groups are forming and thriving, and there’s a proliferation of mad crazy airfare deals to make jet-setting more accessible to the masses. In the spirit of exploration, I wrote posts about a few travel destinations: nearby Catalina Island (pictured below), for a quick weekend getaway, and Houston, which is a marvelous city to eat, drink and be merry in (almost right up there with L.A. — almost). I can’t wait to get back to both of these places!